Tucked among the warren of Department of Physiology and Biophysics labs on the fifth floor of the Rosenstiel Medical Science Building, the one-room lab is tiny, but it is fully equipped to move ideas from the concept and design phases through manufacturing, testing and trial. Taking up half of one wall is a CNC (Computer Numerical Control) milling machine that can automatically chisel the parts Dr. Chang or a student assistant from the College of Engineering — he’s had four so far — design on a computer from raw sheets of metal or other material. 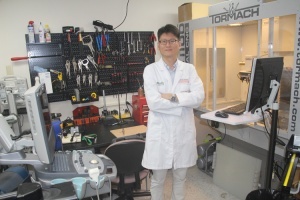 To learn more about the collaborative services or the opportunities for engineering students available at the Interventional Oncology Robotics Laboratory, contact Dr. Chang at dchang@med.miami.edu.